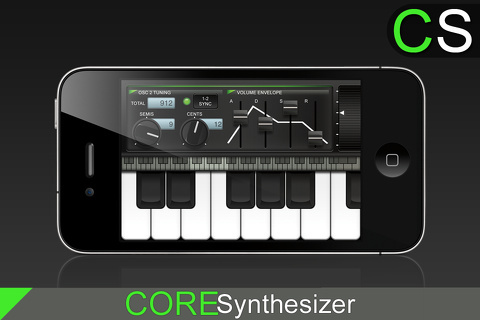 Coresynth is a digital synthesizer by Jasmine Lee for iPhone, iPad, and iPod touch. It is a fairly basic and straightforward synthesizer modeled after old analog synthesizers. 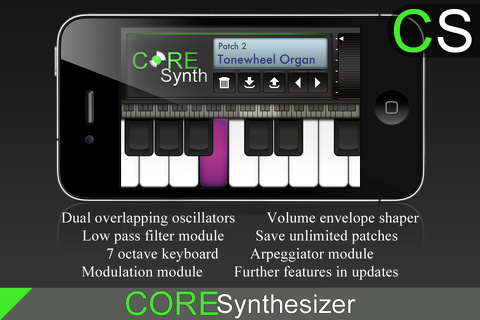 Coresynth, in its simplicity, probably offers one of the more easily navigable and accessible synth apps available. The screen is split into two halves, the bottom half being a one octave keyboard, and the top half being where the controls for all the audio engineering magic happens. The top half has a scrolling bar with three different menus, each containing nice, large, knobs which can be easily adjusted. The first screen has two oscillators with the options of four different wave forms, a volume knob, and an adjustable glide rate knob. The second screen features two detuning knobs as well as four sliders to control the ADSR of the volume envelope. Finally, the third screen has a simple filter with adjustable cutoff, resonance, and ADSR for the filter envelope. I found myself being able to jump right in and instantly start fooling around with different sounds. There is no user’s manual, but anyone who has any idea of how a synth works needn’t have their time wasted with one for this app. Knobs and sliders are adjusted easily, though I found the glide setting hard to work with. I noticed even turning the glide up a little bit would result in a long glide time. Granted it is a free app, but there still are a few features which could have added a great deal to the overall experience. Most notable is the lack of a low frequency oscillator, so don’t even think about getting your dubstep on. The free version also does not allow you to save any sounds, although with such basic features you should be able to recreate them in no time. The full version offers a 7 octave keyboard, as well as an arpeggiator and modulation module. It allows saving unlimited patches and backing them up through the iTunes file sharing system. Upgrading to the full version is quite reasonable, costing only $0.99, a fact that you will be constantly reminded of in the first menu screen. Coresynth is a pretty solid basic synthesizer. Its not about to blow anyone away with its capabilities, but there is little room for complaints considering it is a free app. Upgrading to the full version is very cheap and adds a few nice features. AppSafari review of Core Synth was written by Neema Akhtar on November 9th, 2012 and categorized under App Store, Music. Page viewed 3392 times, 1 so far today. Need help on using these apps? Please read the Help Page.